Money of Japan and Credit Cards - Let's travel around Japan! Yen is smaller unit than "dollar" or "euro" and so on. If you use dollar or euro in your country, roughly you have only to think that yen is "cent". In Japan, there are 10,000 yen, 5,000 yen, 2,000 yen and 1,000 yen bills as paper money. And there are 500 yen, 100 yen, 50 yen, 10 yen, 5 yen and 1 yen as coin. 50 yen and 5 yen coins have a hole in the center. I hear that these are rare in the world. 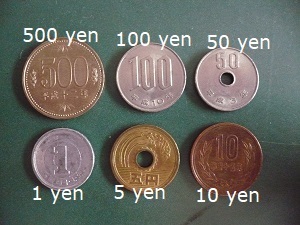 The kind of Japanese money has always been only the unit of 1 or 5. In celebration of the 21th century, 2,000 yen bill as the first "2" unit bill appeared in 2000. But we have a very difficult chance finding 2,000 yen bill. It is said that the "2" unit doesn't adapt to Japanese life. Additionally, the figures on the bills are the following. 10,000 yen : Yukichi Fukuzawa (1835-1901), a scholar, an educator, a thinker. 5,000 yen : Ichiyo Higuchi (1872-1896), a woman novelist. 2,000 yen : Shureimon gate in Shuri Castle in Okinawa Prefecture. 1,000 yen : Hideyo Noguchi (1876-1928), a worldwide bacteriologist. If you want to exchange money in Japan, you had better do it at airport, at big bank or at big post office in the city. There are few commercial exchange shop in Japan. Because there is usually no need for Japanese people, such shop is not good business in Japan. And probably you may not exchange at most hotels and ryokans except high-level ones where many foreigners stay. As above, you should know that the places to exchange are limited in Japan. You had better exchange money when you get a chance. In addition, it is important to make effective use of credit cards. In recent years, the credit card ownership rate in Japan is around 80 percent. So it has been common for Japanese people to do shopping with credit card. But there are not enough shops which can accept credit card. You can use the credit card at the department stores, better stores, better resturants, better hotels, big souvenir stores in sightseeing area and so on. And you can get the tickets of JR and airlines. Also, some convenient stores take credit cards. In any case, check the display of the sign of credit cards in the front of a store. Or, to ask the salesclerk is the quickest way. "VISA" member stores are the first rank of share in Japan, followed by "MasterCard", "AMEX", "JCB" and "Diners". When you buy products in Japan, the price includes "Consumption tax". It is currently 8% of primary price. This tax is based on consumption in Japan, so if you take the products bought in Japan to your country, you can get an exemption of the tax. If you have bought the products at duty-free shop, the price don't include the tax. In this case, you need not mind. If you have bought the products at big department store, big souvenir shop in the famous sightseeing area or big electronics retail store, you may make a turnback procedure of the tax in the store. Please ask a clerk, "I would like to apply for duty-free". If the shop can handling, you can get the turnback after necessary procedures. But generally there are some condition to apply. Probably total purchased amount in the store is required more than 10,000 yen. Food, beverages, tobacco, drugs and cosmetics, and consumable items such as films and batteries are exceptions. Of course, you must not open the package within object products until completion of your embarkation procedure.